The 1911 is one the best-known of John Browning's designs and is considered to be one of the most favored, studied and enduring pistol designs of all times. Since March, 1911 when the US Armed Forces selected the M1911 as its official sidearm, it has been reproduced and copied (cloned) by dozens of other manufacturers, both in the US and abroad. 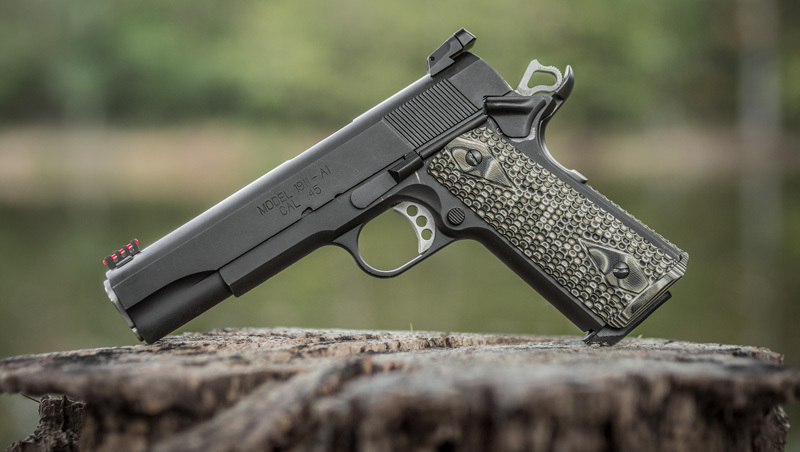 Hogue 1911 grips are designed to accommodate slight variances in screw hole size / spacing and are available for both Full and Compact models in a variety of materials, colors and textures. It’s possible that some 1911 clones may deviate from the original screw hole spacing. If you are in doubt, measure your screw hole spacing and compare. The dimensions shown are approximate.